I am an advocate for proper communication on all levels, so it surprised me when I was told the other night, that I don’t communicate well. It appears that I have become guilty of my pet peeve. Now, I could get all bent out of shape but I chose to take the criticism constructively and I will make every effort to communicate better, especially with Mike (my husband). It is imperative that I work on sharing my thoughts and intents with him. But it is even more important to share those thoughts with the right tone, as I have talked about before. Recently I read an article on Club31Women about wives that never say they are sorry, for a variety of reasons. At first I was surprised by this and then I understood. I have had times when, for our marriage, I needed to apologize but I really believed I was right. So what I have done is find something that I could honestly apologize for. In many instances it is my attitude or my tone or not handling the situation right because those are really the things that I did wrong. It is okay to have a different opinion but I have a responsibility to still be respectful to my husband. I appreciated the article because it made me think. 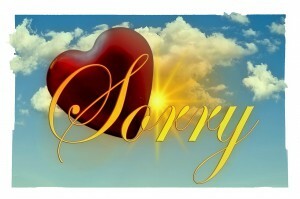 I will endeavor to be quicker to admit my faults AND apologize. I hope this makes you think as well.